Johann Christian Bach (September 5, 1735 – January 1, 1782) was a composer of the Classical music era and the eleventh and youngest son of Johann Sebastian Bach. He is sometimes referred to as "the London Bach" or "the English Bach," due to his time spent living there as well as the musical contributions which he made to the music of England. Johann Christian gave to society through his work and thus both he and England benefited from his creativity. Johann Christian (J. C.) Bach was born in Leipzig, Germany. His father, and possibly also Johann Christian's second cousin Johann Elias Bach, trained young Johann Christian in music. It is believed that Book II of Johann Sebastian’s The Well-Tempered Clavier was written and used for Johann Christian's instruction. 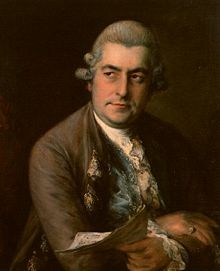 Johann Christian served as copyist to his father, and, on the death of his father in 1750, Johann Christian became the pupil of his half-brother Carl Philipp Emanuel Bach in Berlin. In 1754, J.C. Bach went to Italy where he studied counterpoint under Giovanni Battista Martini, and from 1760 to 1762 held the post of organist at the Milan Cathedral, for which he wrote two Masses, a Requiem, a Te Deum, and other works. Around this time he converted from Lutheranism to Roman Catholicism. He was the only one of Johann Sebastian's sons to write operas in the Italian language, starting with arias inserted into the operas of others, then known as "pasticcios." The Teatro Regio in Turin commissioned him to write Artaserse, an opera seria that was premiered in 1760. This led to more opera commissions and offers from Venice and London to compose operas for them. He accepted the London opportunity and traveled there in 1762. It was to be London where he would spend the rest of his life, much like George Frideric Handel, another composer who decided to make his permanent residence in London 50 years prior. Thus, J.C. is often referred to as the "London Bach." In the meantime, the Milan Cathedral kept his position open, hoping he would return. For 20 years, he was the most popular musician in England. Dramatic works, produced at the King’s theatre, were received with great acclaim. The first of these, Orione, was one of the first few musical works to use clarinets. His final opera seria, La Clemenza di Scipione (1778), remained popular with London audiences for many years. This opera shows interesting parallels with Mozart's last opera in this genre, La Clemenza di Tito (1791), suggesting the younger composer may have been influenced by the elder's score. Johann Christian was appointed music master to Queen Charlotte of Mecklenburg-Strelitz, and his duties included giving music lessons to her and her children, and accompaning the flutist King George III of the United Kingdom on the piano. J. C.'s concerts, given in partnership with Karl Friedrich Abel at the Hanover Square, London rooms, soon became the most fashionable of public entertainments. The most famous musicians in that period participated in those concerts, such as the Italian cellist Giovanni Battista Cirri, and many of Haydn's works received their English premiere in the same building. During his first years in London, Bach made friends with the eight-year old Mozart, who was there as part of the endless tours arranged by his father Leopold for the purpose of displaying the child prodigy. Many scholars judge that J.C. Bach was one of the most important influences on Mozart, who learned how to produce a brilliant and attractive surface texture in his music from him. This influence can be seen directly in the opening of Mozart’s piano sonata in B‐flat (KV 315c, the Linz sonata from 1783 – 1784) which very closely resembles that of two sonatas of Bach’s which Mozart would have known. Moreover, Mozart also admired and was influenced by Bach’s attempt in an early sonata (the C minor piano sonata, Op. 5 no. 6) to more effectively combine the galant style of his day with fugal music. Johann Christian Bach died in poverty in London on the first day of 1782 and was buried in an unmarked pauper's grave at St. Pancras Old Church, with his surname being misspelt in the burial register as Back. Mozart said in a letter to his father that it was "a loss to the musical world." When Mozart had first met J. C. Bach as a young boy, the two were described as "inseparable" by Mozart's father. They would sit at the organ, Mozart on Johann Christian's lap, both playing music for hour upon hour. It is often said by scholars that the music of Mozart was greatly influenced by Johann Christian. This is precisely why, in later years, that Mozart would embrace the elder (Johann Sebastian) Bach's music as well. Johann Christian likely influenced the young Mozart in the forms of the symphony and piano concerto. The spirit and sound of the young Mozart and J. C.'s music is remarkably similar. At the time of Bach's death, Mozart was composing his Piano Concerto No. 12 in A Major, K. 414 where the Andante second movement of this concerto has a theme close to one found in Bach's La calamità del cuore overture. It has been suggested that Mozart's slow movement was intended as a tribute to J. C. Bach, his music, and his importance to Mozart's own work. Although Bach's fame declined in the decades following his death, his music still showed up on concert programs in London with some regularity, often coupled with works by Haydn. In the nineteenth century, scholarly work on the life and music of Johann Christian's father began, but often this led to exaltation of J. S. Bach's music at the expense of that of his sons. Phillip Spitta claimed towards the end of his J. S. Bach biography that "it is especially in Bach's sons that we may mark the decay of that power which had culminated [in Sebastian] after several centuries of growth" (Spitta, Vol. 3, p. 278), and Sebastian's first biographer, Johann Nikolaus Forkel, said specifically of Christian that "The original spirit of Bach is...not to be found in any of his works" (New Bach Reader, p. 458). It was not until the twentieth century that scholars and the musical world began to realize that Bach's sons could legitimately compose in a different style than their father without their musical idioms being inferior or debased, and composers like Johann Christian began to receive renewed appreciation. He is of some historical interest as the first composer who preferred the pianoforte to older keyboard instruments such as the harpsichord. Johann Christian’s early music shows the influence of his older brother Carl Philipp Emanuel, while his middle period in Italy shows the influence of Sammartini. Johann Christian Bach's father died when he was 15. This may be one reason why it is difficult to find points of obvious comparison between Johann Sebastian Bach and Johann Christian. The piano sonatas of Carl Phillip Emanuel Bach, Johann Christian's brother, tend to invoke certain elements of his father at times, considering that his father died when he had reached the age of 36. The use of counterpoint is especially comparable to that of Johann Sebastian. Johann Christian's music, however, departs completely from the styles of the elder Bachs since his music is highly melodic and brilliantly structured. He composed in the galant aesthetic, a style encorporating balanced phrases with an emphasis on melody and accompaniment without too much contrapuntal complexity. The galant movement was against the intricate lines of Baroque music, and instead places importance on fluid melodies in periodic phrases. It preceded the classical style, which fused the galant aesthetics with a renewed interest in counterpoint. The symphonies listed in the Work List for J. C. Bach in the New Grove Bach Family number 91 works. A little more than half of these, 48 works, are considered authentic, while the remaining 43 are doubtful. By comparison, the composer sometimes called "the Father of the Symphony," Joseph Haydn, wrote slightly over 100. Most of these are not fully comparable to Johann Christian Bach's symphonies. This is because many of Bach's works in this category are closer to the Italian sinfonia than to the late classical symphony in its most fully developed state as found in the later works in this category by Haydn and Mozart. Using comparative duration as a rough means of comparison, consider that a standard recording of one of Bach's finest symphonies, Op. 6 no. 6 in G minor, has a total time of 13 minutes and 7 seconds (as performed by the Hanover Band directed by Anthony Halstead). This is compared to Haydn's Symphony No. 94, also known as the "Surprise" symphony, in a typical recording (by Ádám Fischer conducting the Austro-Hungarian Haydn Orchestra) which lasts 23 minutes and 43 seconds. It is clear that the listener of J. C. Bach's symphonies should come to these works with different expectations from the ones he or she brings to those of Haydn or Mozart. Concert halls across America are frequently filled with the music of Haydn, and comparatively rarely with that of J. C. Bach. This probably has less to do with their relative quality (since the music of the latter is clearly accomplished and worthy of being heard) than with their relative historical positions regarding the classical symphony. Yet, J. C. Bach's music is more and more being recognized for its high quality and significance. The Halstead recording mentioned above is part of a complete survey of this composer's orchestral works on 22 CDs for the record label CPO, and the complete works of J. C. Bach have now been published in The Collected Works of Johann Christian Bach. History of "Johann Christian Bach"
This page was last modified on 2 April 2008, at 02:49.